Fairfield Convention and Visitors Bureau has visitor information about Fairfield and surrounding areas. Fairfield Chamber of Commerce has information about Fairfield, and contains a map of Fairfield. The Fairfield & TM® Information Center offers information on local services and activities available in Fairfield, Iowa USA and Maharishi Vedic City, Iowa USA. Fairfield Cultural District website is about Fairfield's Cultural District. The Carnegie Museum is the fifth oldest in Iowa, and is located in an historic building. Limited hours. The Maasdam Barns complex contains a museum/welcome center as well as three historic barns. Discover the significance Fairfield played in early agriculture. 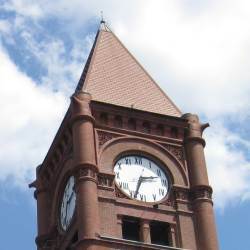 The Fairfield Heritage Tour shows you Fairfield's historic buildings. How much do you know about Fairfield? The Jefferson County Heritage website aims to inspire the future generations that take direction from the lessons of our past & the wisdom of our elders. The Louden Machinery Company was headquartered in Fairfield, and had a huge influence on farming and industry around the world. Fairfield Arts & Convention Center, just off the square, opened November 2007. It includes the 522-seat Sondheim Center Theater. Jefferson County Trails Council website has information about Fairfield, as well as trail details. Find out how Fairfield was chosen as one of Iowa's Great Places. The Fairfield Economic Development Association' website includes a Community Quick Reference PDF. DiscoverFairfield.org is designed to orient new and old visitors to all that Fairfield and Maharishi Vedic City have to offer. Maharishi Vedic City is the newest city in Iowa, four miles northwest of Fairfield. The award-winning Fairfield First Fridays is held the 1st Friday of every month in downtown Fairfield. In October 2002 the ArtLife Society began the 1st Fridays Art Walk, now the Fairfield First Fridays. The Jefferson County Fair, the 1st State Fair in Iowa, is held every year in late June/early July. Vintage Power Wagons has a rally every June, drawing Power Wagons from around the world. See more on the Fairfield CVB website. The Fairfield Art Association has been serving the arts since 1966. The Fairfield Concert Association in Fairfield was established in 1948 to provide varied, entertaining concerts. Iowa Contemporary Art (ICON) provides programs to raise the public's awareness of art, and is a venue for high-quality contemporary fine art. An overview of recreational opportunities in and around Fairfield, from the Jefferson County Trails Council website. Fairfield Park & Recreation Dept sponsors recreational facilities in Fairfield. Jefferson County Conservation Board manages Jefferson County Park and other parks, and camping and conservation areas in Jefferson County. Jefferson County Trails Council website tells the story of the walking/bicycling Loop Trail surrounding Fairfield. Lamson Woods is one of the Iowa DNR State Preserves in Fairfield. Weather in and around Fairfield (from the JCTC Weather webpage). The City of Fairfield website has much information. Also, see their new Facebook page, and find out about the Fairfield Blue Zones Project. The Jefferson County Board of Supervisors website presents information about the Jefferson County (Iowa) government (this website). The Jefferson County Heritage aims to inspire the future generations that take direction from the lessons of our past & the wisdom of our elders. The Fairfield Public Library website includes the story of Carnegie's gift to Fairfield, a University of Iowa project. Let'sGoJeffCo is meant to be Jefferson County's first stop for information and resources to improve wellness via a healthy mind and a healthy body. Fairfield Volunteer Center, make volunteering a community event. Jefferson County Health Center offers a wide variety of services and assists in promoting recreational use of the trails. Pathfinders Resource Conservation and Development (RC&D) Area, Inc. projects are tied to economic development, natural resource conservation or recreation in its six-county area. The Greater Jefferson County Foundation has a grant application form on their website. The Iowa State University Extension in Jefferson County brings Iowa State University resources to you. The Fairfield Daily Ledger is the local daily newspaper. The KMCD/Classic 96 FM website brings you news, weather, events, and shopping. KMCD (1570AM) and Classic 96 (95.9FM). The free Fairfield Weekly Reader is published every Thursday and contains an events calendar. Fairfield Media Center provides FPAC9, Fairfield's local access channel, and more. The Iowa Source, a monthly regional paper published in Fairfield, has a regional Calendar of Events. Iowa Public Radio. Stations nearest to Fairfield in Ottumwa are KDWI (89.1FM) & KUNZ (91.1FM), and in Iowa City WSUI (910AM) & KSUI (91.7FM). The Fairfield History Center is an online museum about Fairfield history. Abundance EcoVillage is a leading example of successful sustainable design in Fairfield. From Fairfield First!, "for the sustainable, local economy in Fairfield, Iowa". The Art on Barns project of Jefferson County. The Bike Fairfield Blogspot is about biking. Fairfield Community School District website. Preschool to Grade 12 at Maharishi School of the Age of Enlightenment. Maharishi University of Management is the local university. Parsons College opened in Fairfield in 1875 and closed in 1973.